The competitive landscape of the global barite market is likely to display consolidated vendorscape. Top players in the global barite market are aiming to unveil different grades of barite to serve diverse end-use requirements. Apart from this, key players are focusing to enhance product quality. Key players are making heavy investment to upgrade their plant facilities in order enhance production capacity. This will help them consolidate their positions in the barite market. Collectively, key players account for over 55% of the overall market share. Some of the predominant players operating in the global barite market are Spectrum Chemical Manufacturing Corporation, Deutsche Baryt Industrie, Halliburton, CIMBAR Performance Minerals, New Riverside Ochre Company, Inc., Excalibar Minerals LLC, and Anglo Pacific Minerals. According to TMR, the global barite market stood at US$1,276.60 mn in 2017. The market is predicted to rise at a steady CAGR of 4.8% from 2018 to 2026. On the basis of geography, North America holds high potential to dominate the global barite market during the forecast period. This is because of the presence of several end-use industries in the region. Of the various applications, drilling mud contributes for over 70% overall market share in the global barite market. This can be attributed to the extensive use of barite in oil and gas industry. However, the segment may lose its share to rubber and plastics in the coming years owing to fluctuating prices of oil and gas. A recent boost to the barite market is credited to shale gas boom in the U.S. and China. The shale gas is an effective substitute of the depleting natural oil reservoirs in the Middle East. This has resulted in rising drilling & production activities to meet energy demand. Barite is primarily used in drilling owing to its heavy weight. This is likely to propel the global barite market. Apart from heavy weight, chemical inertness with other additives, non-toxicity, non-abrasiveness, and easy availability are some other properties that likely to increase demand for barite during forecast period. Moreover, barite is also used in the paints, coatings, and rubbers industries, mainly on account of its high specific gravity. However, the fluctuating price of oil and gas in the international market is a major hurdle for the barite manufacturers. Apart from this, stringent regulations pertaining to the production of barite in key countries is a serious setback for the manufacturers of barite. This has created a regulatory hindrances for new mining activities in various key producing regions. Nevertheless, the global barite market is expected to be driven by growing demand for barite in paints and coatings as well as plastics and rubber industries particularly in developing regions. Along with this rising use of barite in medical industry owing to their excellent purity and absorption capability of X-rays and gamma rays is expected to open lucrative avenues for the growth of the global barite market. 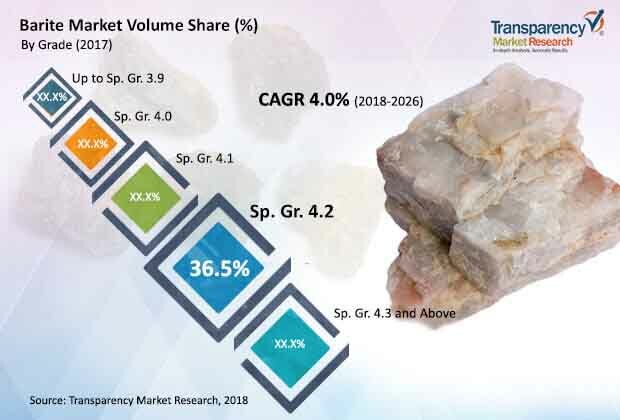 The study presented here is based on a report by Transparency Market Research (TMR) titled “Barite Market (Grade - Up to 3.9, Sp. Gr. 4.0, Sp. Gr. 4.1, Sp. Gr. 4.2, Sp. Gr. 4.3 & Above; Application - Drilling Mud, Pharmaceuticals, and Rubber and Plastics) - Global Industry Analysis, Size, Share, Growth, Trends, and Forecast 2018–2026”.